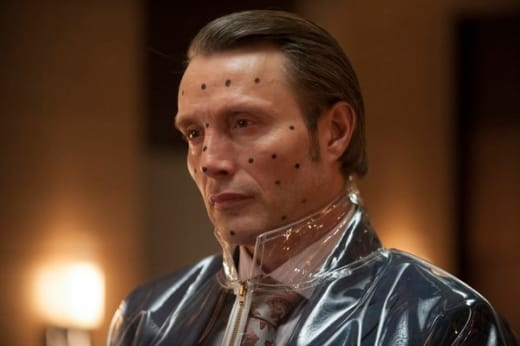 "Buffet Froid" was one of the harder episodes of Hannibal to wrap my mind around, but as I thought about it more, I’m beginning to think that was the entire point... aside from Will’s Advanced Encephalitis and the shocking ending. Will’s Encephalitis that has taken over one entire half of his brain is a development on its own. The kind of situations Will is investigating for the BAU is deeply traumatic for him already and his hallucinations are only growing worse. While there’s no real knowledge at this point if Will’s job is the cause of the Encephalitis, it’s still interesting to ponder if his body is fighting against him each time he puts himself in the head of the killers. But the biggest development is that only Lecter knows about the disease. He continues his sympathetic, good guy persona, but his manipulations of Dr. Sutcliffe under the guise of friendship and research make it clear: Lecter wants to pry deeper into Will’s brain and manipulate him further. By making Will think it’s mental rather than physical, Lecter can provide the necessary support and counseling Will thinks he needs. And Lecter can continue making sure Will and the BAU stay on good – and trustful – terms. The bigger idea behind Lecter’s manipulations is that he probably knows only Will has the skill set necessary to catch him... and if he can guide Will towards a shiny new straight jacket he’ll be free to continue killing. The difficulty from “Buffet Froid” stems from Georgia (and, yes, apparently the character is a reinterpretation of the Dead Like Me character, according to Bryan Fuller) being sort of dead but not really. Did Will imagine meeting her? Did Georgia really follow him. And what is her role in the murders? 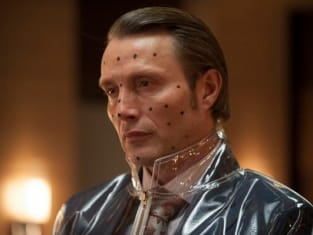 What is shocking, and what is going to make the rest of Hannibal Season 1 so exhilarating, is that Georgia “saw” Hannibal brutally murdering Dr. Sutcliffe. She just needs to begin to uncover and unmask his face. Knowing Hannibal, Lecter is most likely going to be the man who is going to help her get over the trauma she’s experienced. NOTE: NBC renewed Hannibal for Season 2 today! I am not sand; I am bedrock. Permalink: I am not sand; I am bedrock. I feel like I'm fading. Permalink: I feel like I'm fading.